Both Domagoj Burilović and Tilyen Mucik are the recipients of the renowned PhotoDays Rovinj festival awards in the Artistic Concept category. In the exhibition at the Photon Gallery, they present their recent series Post Factum and Flora Femina. Tilyen Mucik is a Slovenian photographer who is currently finishing a post-graduate degree in Photography at the Academy of Fine Arts and Design in Ljubljana. She received an award in the “Artistic Concept” category at the PhotoDays Rovinj festival in 2018. In the field of photography, she explores the themes of womanhood, botany and her own past, that are also present in her photography series Flora Femina. The author combines the motives of women and plants in this project in a variety of ways. 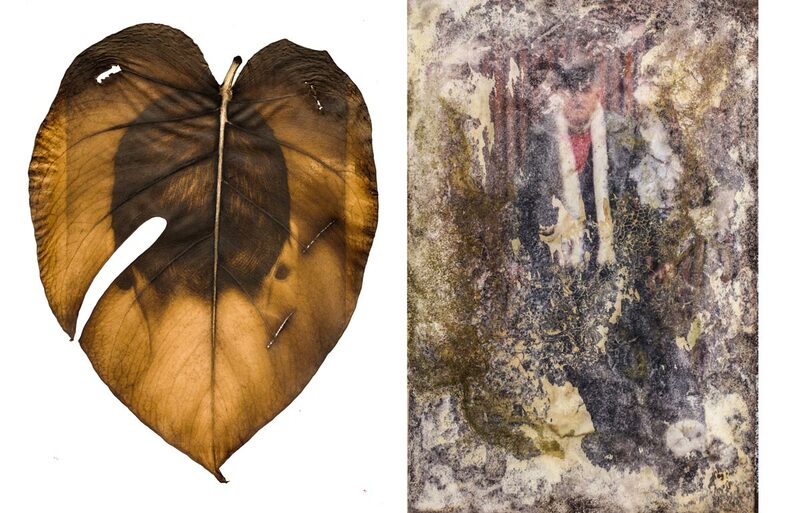 She uses different techniques like digital and analogue collage, as well as experiments with the direct influence of plants on the photographic film, which she combines with the vintage anthotype photography technique and the alternative chlorophyll process. The project consists of experiments and is based around the author’s creative process, in which photography becomes a side product, and presents a blueprint of emotions, that the author experienced throughout the project. Domagoj Burilovć is a young Croatian photographer and a MA Fine Art graduate from the Academy of Fine Art in Split. He received the “Grand Prix” award at the PhotDays Rovinj festival in 2017 for his Post Factum series. He deals with conceptual art, design, conceptual, as well as commercial photography and video art. The Post Factum series was created when the artist stumbled upon a discarded leather bag on the streets of a small Dalmatian town, full of documents and personal belongings of an unknown man dating back to 1922. Burilović decided to document the contents of this bag, without overtly focusing on the details about the man’s identity, nor the place where the bag was found. The author thus attempts to take on the role of a factual narrator and tackles the (re)construction of the story in a neutral way. The objects, which have long lost their original form and function, are placed in the context of the author’s own interpretation in their decayed state. They are stripped of their histrorical meaning and are arranged to convay a nationalist myth about the life of an Ustasha emigrant. The author’s highly conceptual approach is imbued with ambiguity, that leaves the viewr to question whethet the tale of the found bag itslef is real.